Ceramica Althea SpA produces in its manufacturing plants sanitary ware of the highest quality, using the latest generation systems that combine high technology to the experience and know-how, resulting from 20 years of experience. 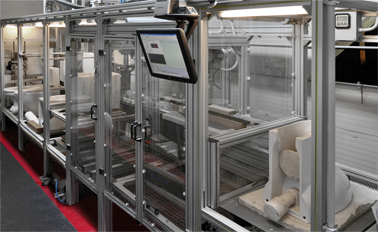 The entire production process is characterized by a high degree of automation both at the casting and glazing stage carried out by robotic systems of the latest generation, but at the same time, preserving the art of the ceramic traditions through an artisan production still handmade. The rigorous controls of all the working phases and the formal attention dedicated to the study of the products ensure, that the production Althea represents one of the widest ranges of ceramic products present on the market, functional and especially able to satisfy all tastes and needs. The very important aspect of economizing water is displayed also at the design stage, in fact all wc bowls are optimized for a evacuation of 3.5 / 4 liters of water. 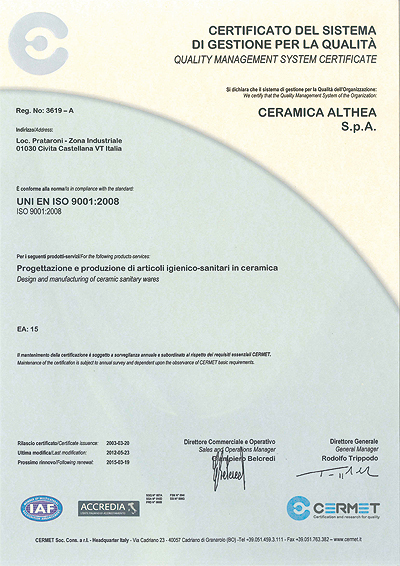 The high quality offered by the company is recognized and attested by the UNI EN ISO 9001:2008 certification, which regulates the quality management system starting from the human resources up to design and manufacture, and the control of the finished product, in accordance with a system designed to improve the service in order to increase the customer satisfaction. In full compliance with the EU directives, the Althea products are CE marked in order to indicate that the product complies with all the Community provisions regarding its use starting from the design, production, the placing on the market and the putting into service of the product up to its disposal. The company is internally provided with a technical laboratory, equipped with machinery for controlling quality and functionality, where the performance of the products is tested confirming the suitability for the introduction on the market.